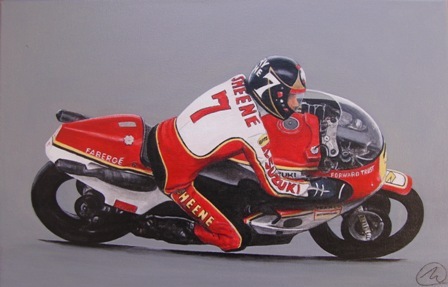 At 1.30am this morning I put the final varnish coat onto my painting of the late Barry Sheene. Changed the background colour slightly again to make the bike & rider stand out more, and basically worked on all the detail. Still thinking about painting another number 7 (but of my favourite rider), ex Motogp and now in World Superbikes – Carlos Checa.